Family Espiritu Guerrero (son), not related to Gran Markus Jr.
Juan Chavarría was born on December 27, 1938 in the Lagunero city of Torreón, Coahuila. A bit of geography first. The Laguna region, so famous now because of Blue Panther, Black Warrior and Dr. Wagner Jr., is formed by various cities but the most important ones are Torreón, Coahuila and Gómez Palacio, Durango (twin cities separated by the Nazas river) and Ciudad Lerdo, Durango (home of Angel Azteca, and separated from G. Palacio by a street). Like most wrestlers of the Laguna region he was trained by legendary local maestro Halcón Suriano and he made his debut in the now extinct Arena Charro Aguayo in Torre&oacuten against Manny Moñetones. 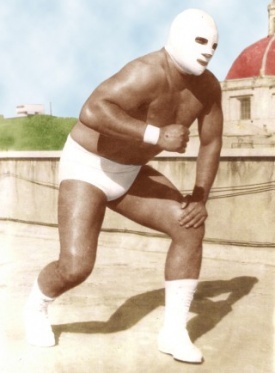 Markus became a star of note in the 70s attaining in Mexico important victories like winning the hair of both Enrique Vera and Raul Reyes (both at Arena México), and the mask of Texas Ranger (Jose Lothario) in the Plaza de Toros Monumental de Monterrey. It was in Mexico when he started his legendary feud with Jose Lothario, even beating him in a match for the Northern Heavyweight Title in Monterrey. Markus is a member of the select club of Mexicans that made it in the USA as big, or bigger, than in their home country. He wrestled extensively in Texas during the 70s and the early 80s where he earned a reputation as a good brawler and a good worker. Here he continued his feud with Lothario, who in the US was his tag team partner for a while until Markus turned on him. Then Markus joined another guy that had turned on Lothario, the legendary Gino Hernandez, and formed an awesome heel team that is still remembered very well by older Texan fans nowadays. Some of Markus' bouts against Lothario were total bloodfests. But Markus also had other feuds, the most relevant one teaming with Gino against El Halcón (Danny Ortiz) and Kevin Von Erich in the World Class Championship Wrestling (Texas) circuit. The Von Erich family always brought a lot of attention with themselves, but Markus showed that he was over and could draw a lot of heat by himself. During his tenures in the US, he was managed by The Baron (around 1975) and later by J.J. Dillon, and he captured belts like the Texas Heavyweight Title (winning it from Red Bastien on May 28, 1975 in Dallas, TX) and he had two NWA American Tag Team Title reigns with Gino Hernandez, always winning and losing the title against Lothario and Halcón. The first win was on July 20, 1979, they lost it two months later, won it back on December 14 and lost it 14 days later. All the matches were in Houston. But Markus also had success in his home country. His feud with El Halcón also had long lenghts in EMLL, and they traded the Mexican Heavyweight Title once, though Markus had another title reign after defeating TNT... but he ended up losing the title to Halcón as well. He also formed a legendary team that is still a known name for newer fans: the original La Ola Blanca (The White Wave) super rudo team which he formed with Angel Blanco and Dr. Wagner. During the latter 80s he mostly wrestled in Northern Mexico where he had a feud with Anibal that culminated in a mask vs. mask match that Anibal won. And speaking of Markus losing his mask, he never lost it against Mil Máscaras in the US. I reported it in my page before as I had read it on the Lucha Libre Magazine, but Markus informed me that this was just something that Héctor Valero made up to hurt Markus (who he hated). In those last years of his career, Markus also had a team and later a feud with Gran Markus Jr., who isn't his legitimate son, but had his aproval to use the name. They also had a hair vs. mask match that the junior won. Markus' last match was in 1990, in the Auditorio Municipal de Torreón, teaming with Gran Markus Jr. and Angel Blanco Jr. against Octagón, Ángel Azteca and Stuka. The cause of Markus' retirement was a pancreas illness, which is the same illness that caused Medico Asesino's death. He noticed that he was ill a few days before the mask vs. mask match between Blue Demon and Rayo de Jalisco in Monterrey, where he was scheduled to wrestle in the semi final match. He however was going to work that date, but a day before the card and with everything ready to wrestle, he fell very ill. Markus however had a miracle and his enormous strenght helped him stay alive, but he had to retire. Nowadays he's still a bit ill, but he's not in bad health shape and nowadays lives off the renting of a wrestling ring and two taxi concessions. He fondly remembers his wrestling days, traveling all over Mexico, the Southwest, Guatemala and Central America, and some of his opponents. The guys he thinks of as his toughest foes are Mil Máscaras, Enrique Vera and El Halcón, and his favorite team partners were Gino in tag competition, and Blanco and Wagner in trios. There was a rumpor that he had passed away in July '07 however Silver King put those rumors to rest by taking photos of himself with the original Gran Markus who requested that all the wrestlers using his name illegally please stop. 81/06/14 mask Gran Markus Texas Ranger Plaza de Toros Monumental - Monterrey, N.L. 88/04/22 hair Perro Aguayo Gran Markus Plaza de Toros Monumental - Monterrey, N.L. This page was last edited on 24 April 2017, at 11:43.